Last time I attended the Oracle day in Athens, Greece, I was impressed by a presales consultant stating that the real difficulties of SOA projects arise not in the first project, but in the second. That is when there is already a prebuilt foundation of services, on which one needs to base the new applications of the second project. This is the time to prove whether the initial design is worth of the effort, time and money spent.You have guessed it right, it is all about agility, adaptability to business, or IT changes, and service reuse! but one of the most common reasons is the migration between the development, test, and production environments. A service registry is also helpful when we need to version services and manage changes. 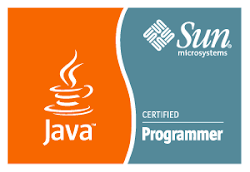 With a service registry, we can also develop more loosely coupled composite applications, because we do not need to hard-code the service URLs. Rather, the application will resolve URLs at run time." Installation failed. If accessible, see "C:\Oracle\Middleware\registry111\log\install.log". 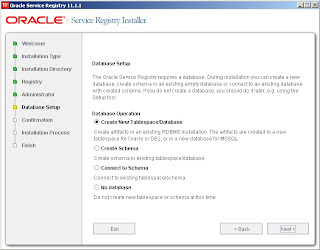 However many times one tries, with the options selected as shown in the db options screen shot, the installation fails due to some build error of the db scripts. Although the installation appears to have failed, the db uddiuser schema has been actually created. On the contrary, some people report that one is better off to create the schema on his own, as you can see in the references. 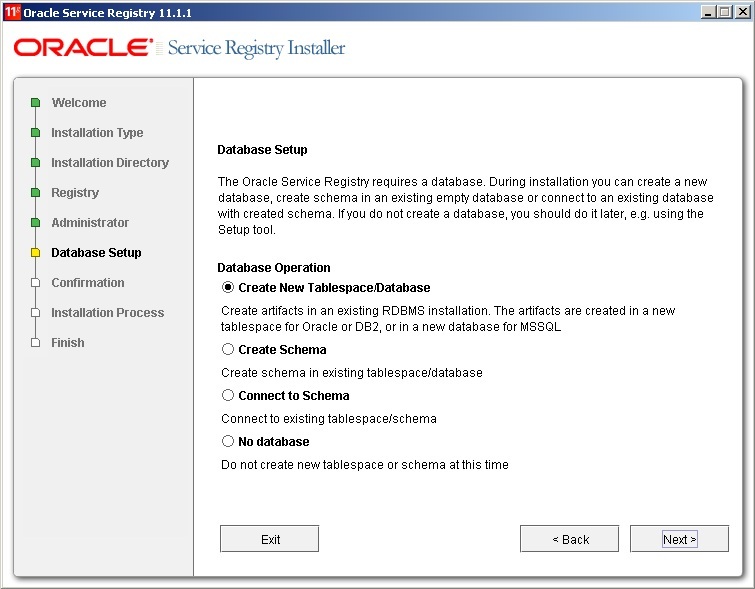 Thus, when one runs installation the next time, having selected an existing db schema "Connect to schema" option, all appears to go well. Well, not everything! If one uses jetty instead of weblogic server, the create data source option does not apply. Therefore, one needs to uncheck the selection, in order to avoid receiving a "Cannot obtain new connection" exception. The morale of the story is quite obvious, if related to the introduction of the current post: the first time is just the basis, the second time is what matters most. Happy new year to you all! our Oracle DB version is 11. JDK used 1.6+ and ojdbc6.jar driver used. Please suggest why this message is showing.